There is such appealing clarity in the bearish pattern shown that we should have no qualms whatsoever about sticking with our game plan to catch a profitable ride on the little sonofabitch. That means never chasing a rally, buying only on weakness, and doing so only when VXX is at or very near a Hidden Pivot swing point. At the moment, that would imply a print within a few pennies of the 14.64 downside target shown. If the trade sets up that way, we’ll use call options to leverage the anticipated bounce. 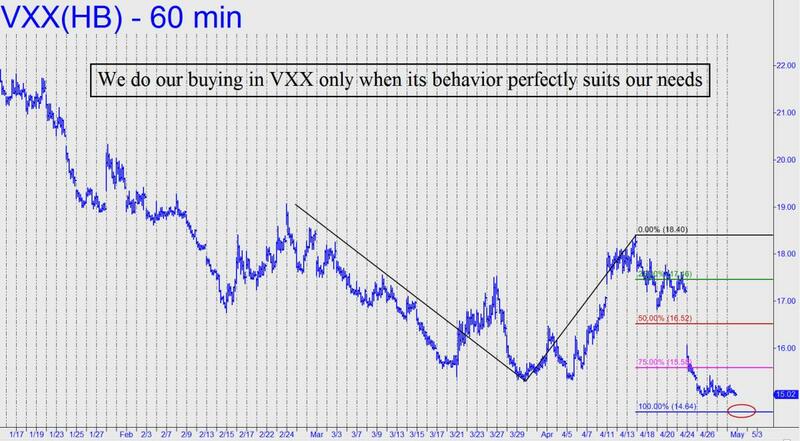 So far, it has been a waiting game as we’ve pushed back the expiration date due to VXX’s screw-all-of-you price action. Now, let me suggest bidding 0.50 for eight May 19th 15 calls, good through Wednesday._______ UPDATE (May 1, 11:11 a.m.): VXX is getting crushed today, trading at new record lows. The actual intraday low so far is 14.64 — my target precisely. Subscribers have reported buying the calls for 0.50 or slightly less, so I’ll use 0.50 as a cost basis. Now offer half of them to close for 1.00, good-till-canceled. These are keepers with no stop-loss. Be prepared to write off the entire $400, since this is a highly speculative bet that goes against a long and powerful downtrend. _______ UPDATE (8:38 p.m.): VXX subsequently fell to new depths, raising the prospect of a further plunge to as low as 13.31 over the near term. Regardless, we’ll sit on the calls for now. Click here for an hourly chart that shows the 13.31 target clearly. A drop of that magnitude is difficult to imagine although hardly inconceivable. All it would take would be for the stock market to go comatose, in a sideways-to-slightly-up trend, over the next 3-5 days. (Note: An alternative target at 14.09 could brake the fall. It can be calculated by sliding ‘A’ down to 21.73 (1/19/17). _______ UPDATE (May 8, 7:40 p.m.): Wow. There really seems to be no bottom for this brick. VXX fell below the minor support at 14.09 flagged above, presumably bound for 13.31. The VIX on which it is based looked even worse, falling to within 0.29 points of the all-time low achieved in December 2006 (click here for chart).